The goal of the project is to build a custom tabletop STM in order to study materials on the atomic scale with high resolution, to be completed this semester on a shoestring budget. Such a device will be even more than a practical piece of equipment: it will serve as a hands-on learning experience for its makers as well as a great teaching tool for the club. Its mechanical, electrical, and computer interface systems were designed by us and will be built mostly from scratch. The source code and schematics will be made available on our website. A labelled model of the STM assembly. 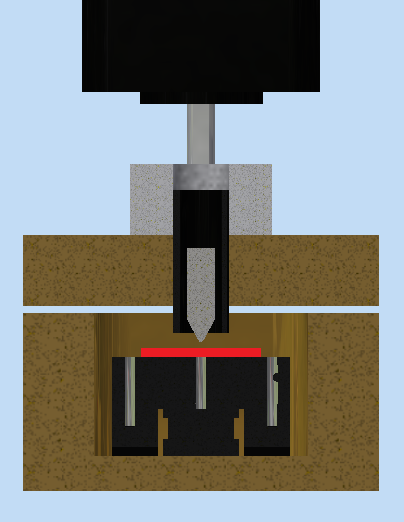 The most basic component of the STM is a conducting tip, held at a tunable bias voltage, that measures the tunneling current between it and the sample. 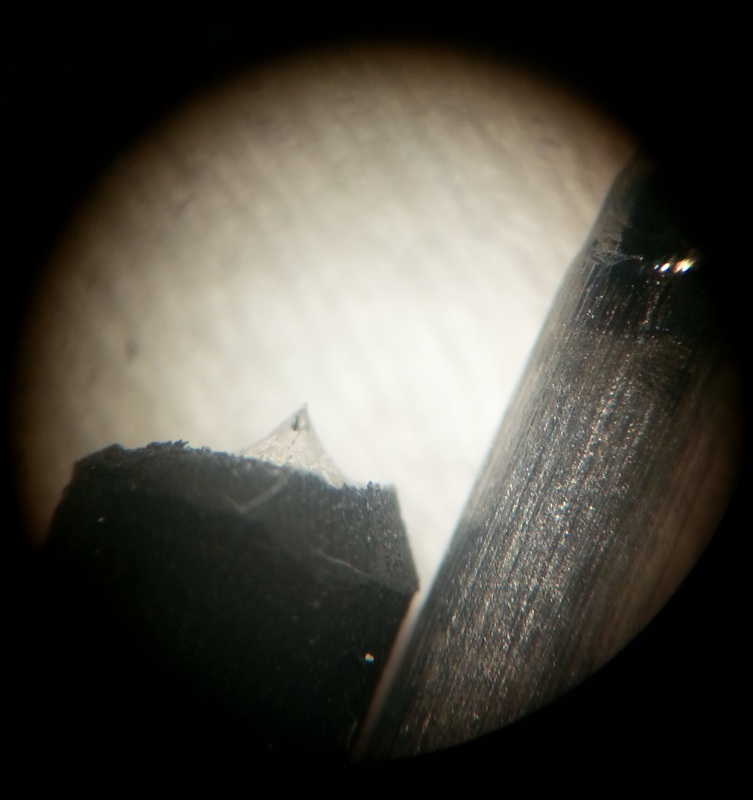 Since lateral resolution depends on a small radius of curvature, we are electrochemically etching our own tungsten tips to make them nearly atomically sharp. The scanning motion of the tip must be precise to atomic distances, so the tip will be housed inside a tube composed of piezoelectric material, which can be strained with small voltages, owing to a coupling of dipole/electric field interaction and mechanical motion. 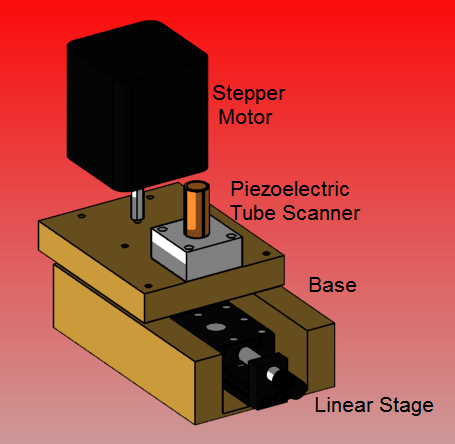 Such elements, called piezo tube scanners, have four sections of piezoelectric material that allow for reproducible motion in all three Cartesian coordinates. The etching process’s experimental setup. 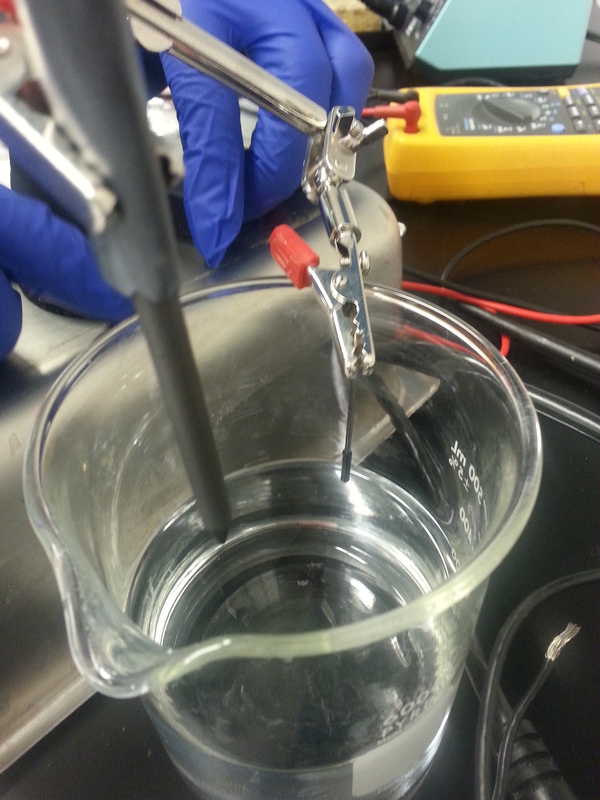 Electrochemical etching produces nearly atomically sharp tips. The sample will rest on a vibrationally isolated base to reduce noise in the signal. The base itself will be machined from brass, and will rest on a series of plates separated by rubber O-Rings with varying thicknesses. These are calculated to reduce oscillations at specific vibrational modes, especially near the resonant frequency, which lies close to the frequency of footsteps, about 10Hz. A section view of the assembly, revealing the tip over the sample. The sample will be mounted on a linear translation stage for horizontal alignment. For rough vertical positioning, the base will mount a precise stepper motor that will microstep to rotate a set screw far from our sample, acting like a lever. This will permit translations smaller than 200 nm, after which the piezoelectric tube can fine-tune the vertical spacing between the tip and the sample. The tube can translate by over 350 nm at 70V, which gives us some margin of safety against collision when the tip approaches the sample. Since the tunneling current is on the order of nA, we will employ a transimpedence amplifier, or I/V converter, with high gain near DC and a high unity gain crossover. Our design uses a two-stage amplifier with precautions to reduce noise, especially in the threshold of thermal energy, ~kbT, and at the microscope’s resonant frequency. The feedback loop for the microscope’s tip will be controlled with an Arduino Due for simplified implementation. This will allow us to descend within sensing range without crashing into the sample, and then to scan precisely in the plane of the sample. From then, there are several experimental techniques for studying materials. For these, it is necessary to be able to modulate height and current separately while scanning, which require knowledge of how the x, y, and z lateral motions are coupled. We will also need to modulate the tip bias for more advanced dI/dV measurements; however, our STM may not be precise enough for this functionality because it is at room temperature. After passing through the aforementioned preamplifier, the signal is read in MatLab via the Arduino Due with the use of a tethered support package. This low-cost workaround to a DAQ allows this project to be made inexpensively, without sacrificing much performance, and permits immediate data processing without LabView. The Due is beneficial because it has an 84MHz clock rate, and its DMA controller will hopefully keep our feedback loop steady. As physics students, we most look forward to writing code to analyze the resulting data, and hope to produce a suite of programs for visualizing the topography and conductance of samples in MatLab and in IGOR.